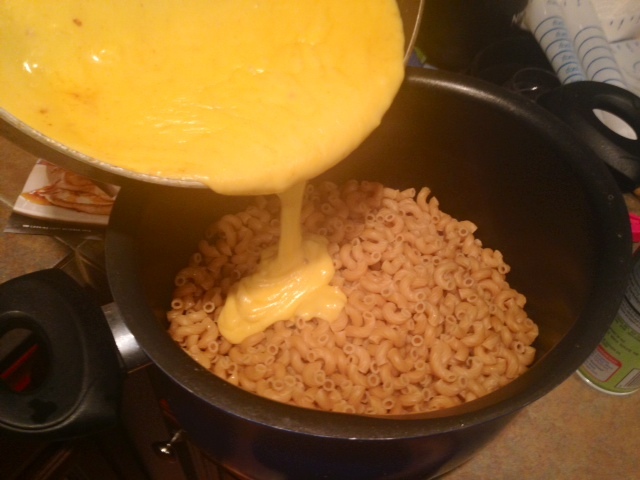 I used to be really scared of making mac & cheese. I mean the legit baked kind where the sauce starts with a roux and there’s whisking involved. Whisking is one of those things that kind of intimidates me. I have no idea why, but it seems very serious. For some reason I was really just craving some comfort food last weekend, but needed it to be healthy comfort food—I’ll be on a beach in a swimsuit in a couple weeks (vacay, finally!) and do have a little bit of vanity left in me. 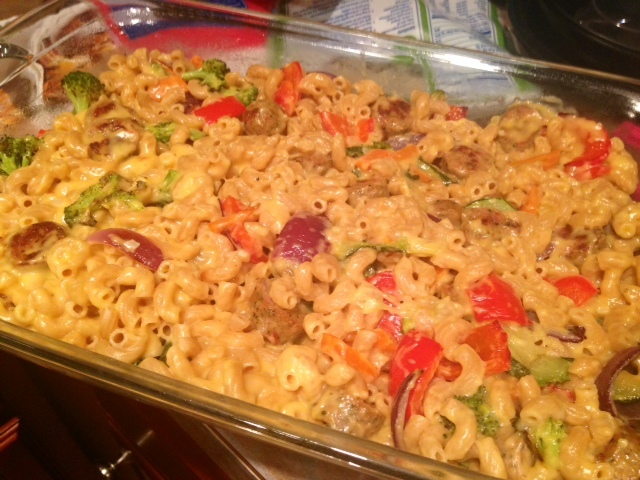 So this recipe, with its hearty roasted vegetables, whole wheat pasta, and olive oil-based cheese sauce, called to me. One of the things that really intrigued me about this recipe is that the roux—basis for the bechamel cheese sauce—is made with olive oil instead of butter. Honestly, I don’t know that I’ve seen a roux recipe without butter, so I was definitely interested to see how that went. And I quite liked it. 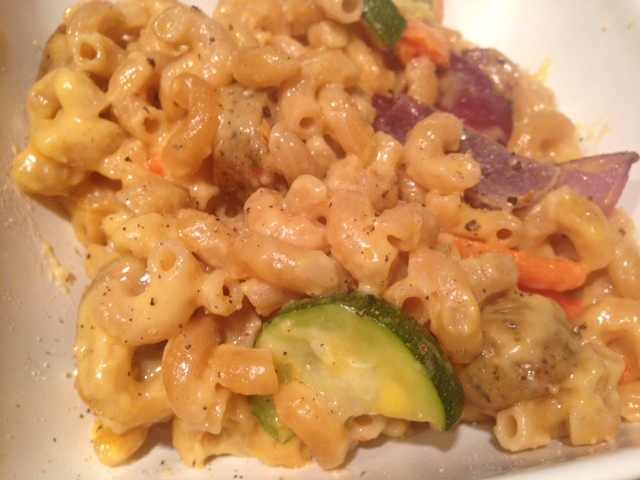 It gives things a little bit of an olive oil-y flavor that, when combined with the flour and whole wheat pasta, was a different twist on a regular mac & cheese. First, a little preparation. Preheat your oven to 425 F. Set a large pot of water to boil. Line a large baking sheet (preferably with sides) with aluminum foil. And spray a large 9×13 pan with non-stick spray. 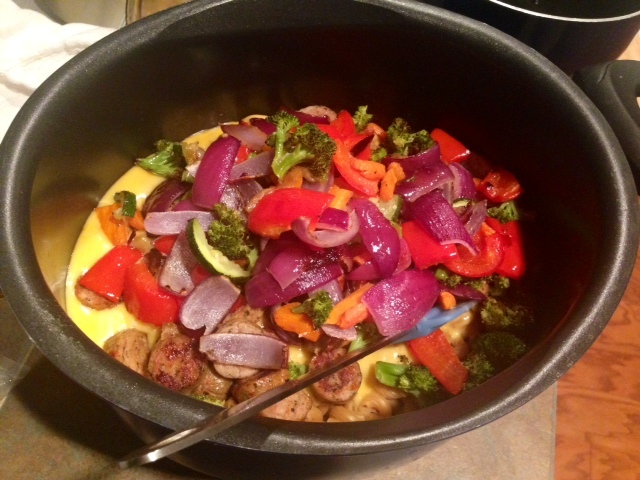 To start with, we want to get the veggies in the oven and roasting, from a time management standpoint. 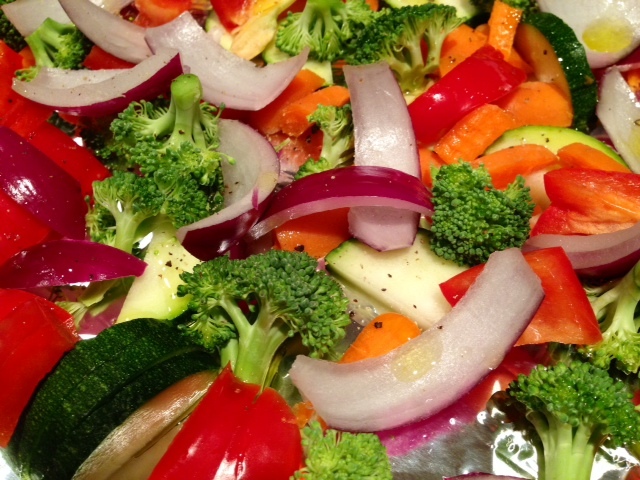 Cut and dice your veggies and toss them onto the baking sheet. You can pretty much use whatever veggies you want. I’m not partial to broccoli but used since the recipe called for it—probably wouldn’t again. Red and orange bell peppers, red onion, zucchini, and squash are always solid performers. Drizzle with olive oil, salt, and pepper, and give them a stir to lightly coat everything. Bake for 20 minutes, or until vegetables have softened and begun to look brown and roast-y. Set them aside on a kitchen counter once they’re done. Since I meant for this to be my whole meal, I added chicken sausage. I get this stuff at Trader Joe’s (it’s the sun-dried tomato one, there are only a couple that don’t have pork casings). Just slide it up and saute with a little olive oil for 5-10 minutes. Set that aside too. You also want to get the pasta going. Once the water is boiling, liberally salt it and add the pasta and maybe just a tiny drizzle of olive oil (to keep it from sticking once drained). Cook according to the package instructions, minus maybe a minute to keep it a little al dente. Drain and set aside. This part always stresses me out a little, like if I don’t do everything perfectly it will be a disaster (spoiler alert: not true). So while everything else is cooking, heat the olive oil in a large skillet over medium heat. When it gets hot, add the garlic and cook for 30 seconds. You don’t want to cook it longer than this or the garlic will scorch. 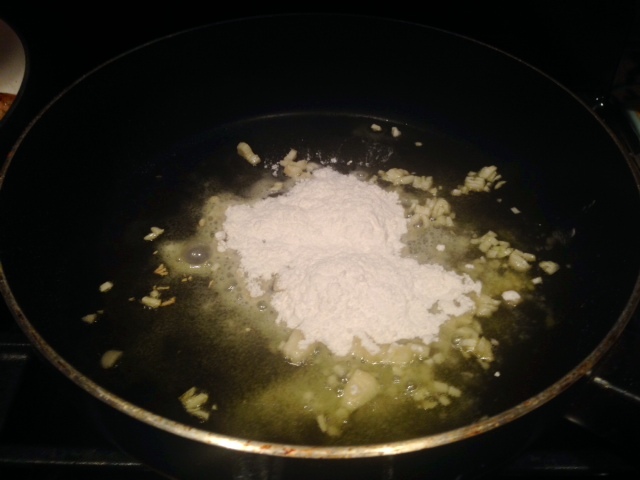 Then quickly whisk in the flour and cook for 1 minute, stirring continually. 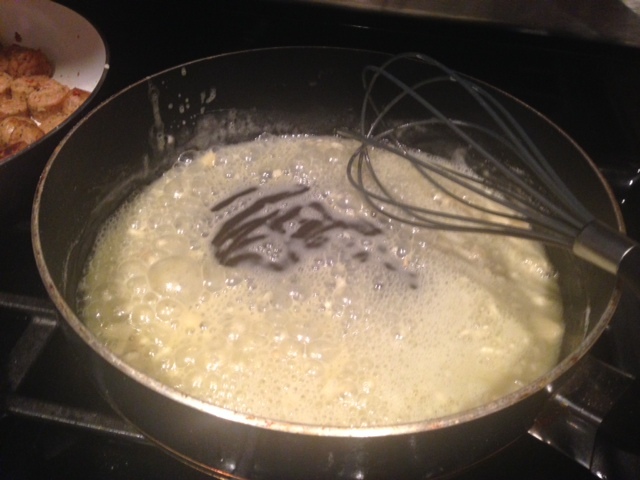 Gradually whisk in the milk, stirring constantly, until everything is totally incorporated and the mixture has thickened slightly. Remove from the heat and stir in the cheese. Add your red pepper flakes, white pepper, salt, paprika, and (if you’re brave) cayenne pepper. 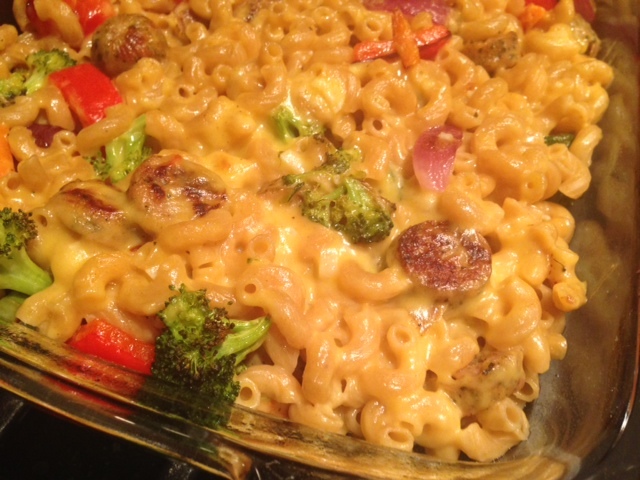 If your skillet is large enough (or in your pasta pot) stir together the pasta, cheese sauce, sausage and vegetables. Pour the mixture in a large casserole dish and sprinkle with panko breadcrumbs (which I realized I didn’t have). Place under the broiler in your oven (500 degrees) for 3-4 minutes, or until the top is golden brown. Keep a close eye on it, because it can burn very quickly! 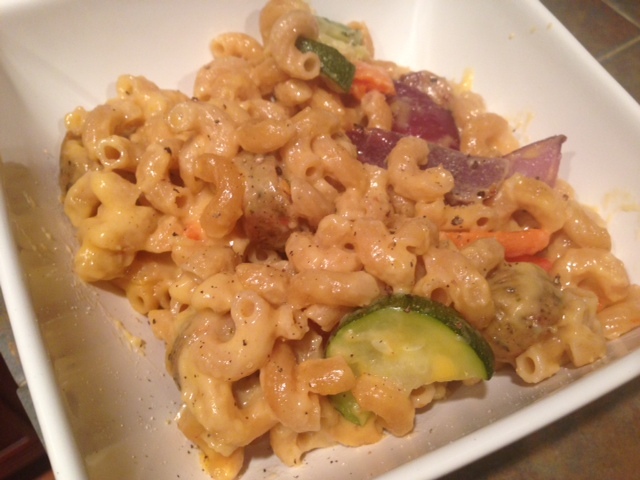 This was definitely the easiest mac & cheese I’ve made (mostly because it didn’t have to bake for 20-30 minutes). I was really surprised because, even though it seemed to have a lot of steps, it was on the table in under an hour from start to finish. And the leftovers were so good! Preheat oven to 425 F. Set a large pot of water to boil. Line a large baking sheet (preferably with sides) with aluminum foil. Spray a large 9×13 pan with non-stick spray. 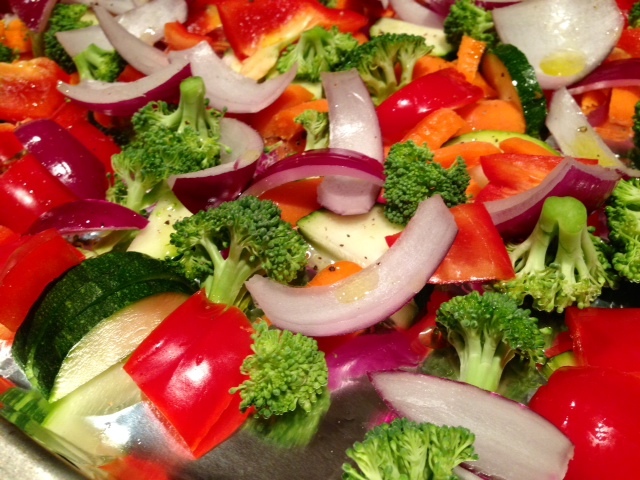 Cut and dice your veggies and toss them onto the baking sheet. Drizzle with olive oil, salt, and pepper, and stir to lightly coat everything. Bake for 20 minutes, or until vegetables have softened and begun to look brown and roast-y. Remove from oven and set aside. Once water is boiling, add a handful of salt and add pasta, and cook according to the package instructions (keep it a little al dente). Doesn’t hurt to add the tiniest drizzle of olive oil to prevent the pasta from sticking together once it’s been drained. Drain and set aside. 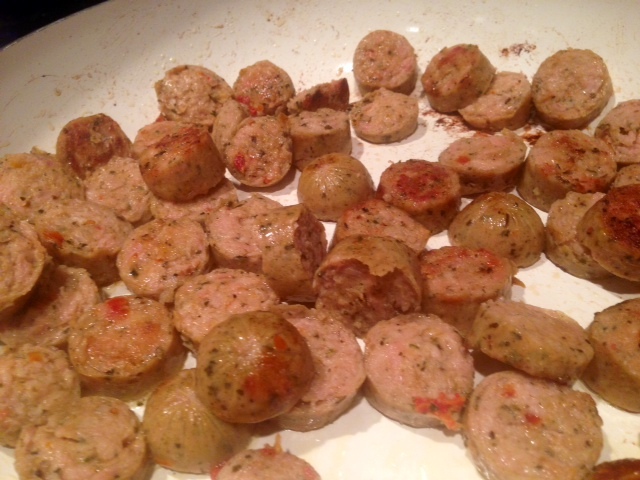 If you’re including sausage, cut the sausage into disks and saute with a little olive oil until browned and crispy. Set aside. While everything else is cooking, heat oil in a large skillet over medium heat. Once it’s hot, add the garlic and cook for 30 seconds (not more than this or the garlic will scorch). Quickly whisk in the flour and cook for 1 minute. 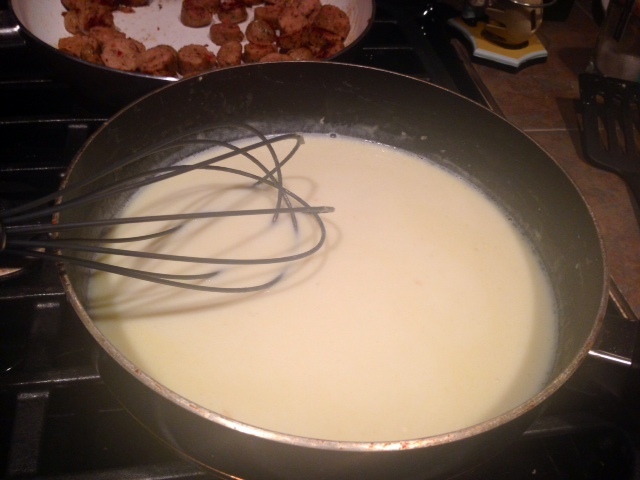 Gradually whisk in the milk, stirring constantly, until the mixture is totally incorporated and slightly thickened. Remove from heat. 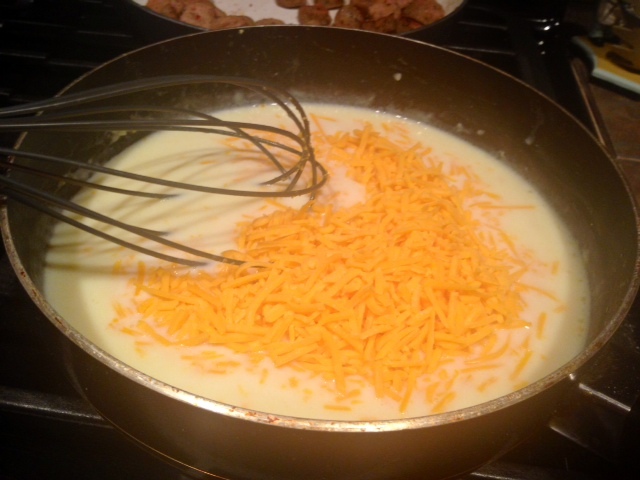 Stir in the cheddar cheese until well distributed and melted. 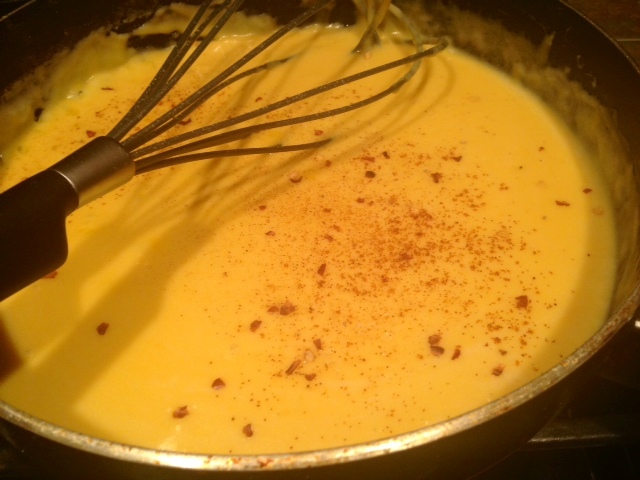 Add red pepper flakes, white pepper, salt, paprika, and cayenne pepper (if you want). 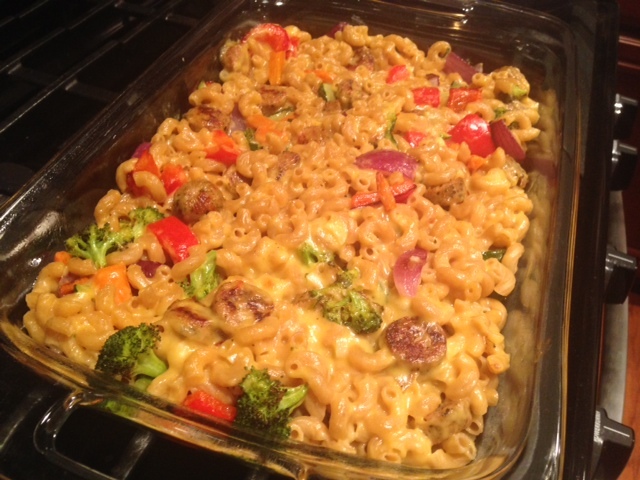 Stir together the macaroni, sauce, sausage and vegetables. 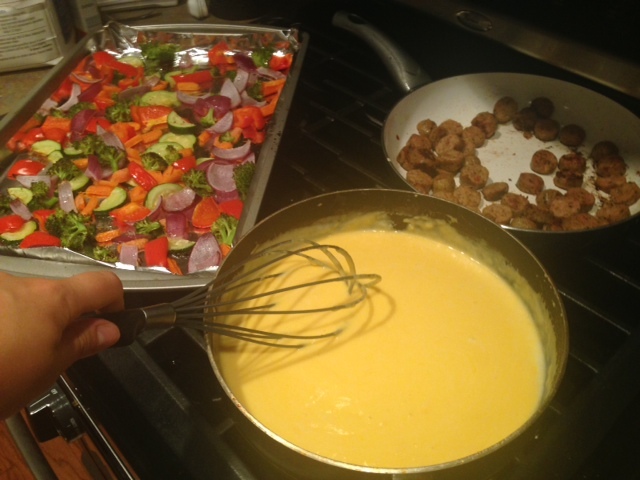 Pour the mixture in a large casserole dish and sprinkle with panko breadcrumbs. 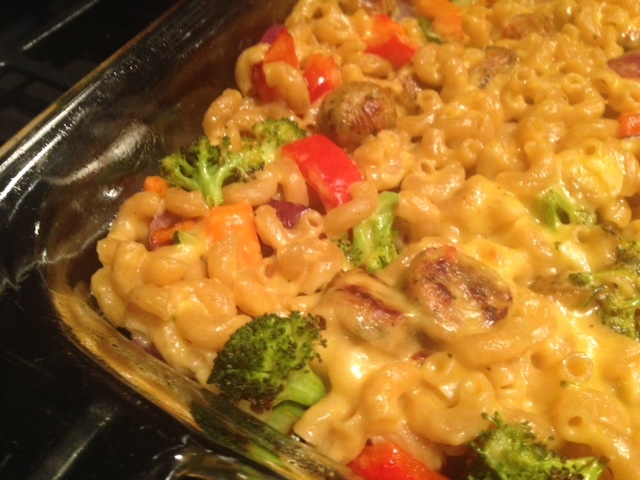 Place under the broiler in your oven (500 degrees) for 3-4 minutes, or until the top is golden brown.